A lively, engaging and counterintuitive exploration of success stories from across the globe, and what Michelle Obama referred to as ‘the flimsy difference between success and failure’. In this lively and counterintuitive exploration of success stories from across the globe, award-winning journalist Hamish McRae takes the reader on a fascinating journey in pursuit of the flimsy difference between triumph and failure. Why do some initiatives take off while others flounder? How have some communities managed to achieve so much while others struggle? What distinguishes the good companies from the bad? This thoughtful, engaging look at some of the world’s greatest success stories provides an optimistic and eminently practical guide to what works and why. What lessons can we learn from the surprisingly well-ordered Mumbai community made famous by ‘Slumdog Millionaire’? Why have Canadian manners helped Whistler become the most popular ski resort in North America? How has Zurich developed the world’s most admired anti-drug policies? And how has Hong Kong used gambling profits to help its residents enjoy the greatest level of economic freedom on the planet? Drawing life lessons from the great ideas put to work on every continent – from America to Europe, from Africa to Asia and Australasia – McRae’s stories are as surprising as they are inspiring. We are better placed now than we have ever been to make good choices about the future of our species and our planet. But if we are to face the many challenges ahead, we have to try to learn from each other. 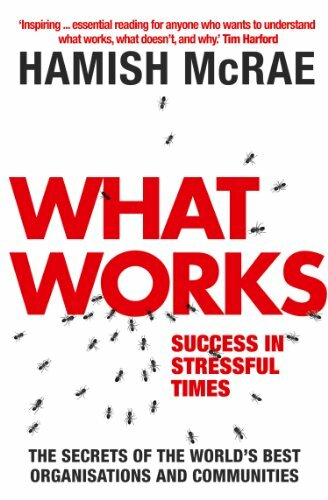 ‘What Works’ will leave you entertained, informed and, ultimately, enlightened as to what each of us can do to make successes of our businesses, our communities and our lives.